Vanessa Williams Live In Rahway, NJ: She Still Has "The Right Stuff"
I never thought I’d have the chance to see Vanessa Williams live in concert. I’m a 20 year-strong Vanessa Williams fan, starting with her Christmas album Star Bright, and my favorite Christmas film A Diva’s Christmas Carol. For years I’ve yearned to see her perform live. When she took on the role of The Witch in a revival of “Into The Woods” in 2002, I was lucky enough to be there. Beyond that, it’s always been a dream. I am still ecstatic at scoring tickets to the taping of VH1 Divas: Unsilent Night next week which is a dream in it’s own, and then fate decided to deal me a full house. On Monday, I caught a tweet from Union County Performing Arts Center. UCPAC is a small theatre with a capacity of less than 1500. The last show I saw there was Ray Charles in 2002. Despite the size, it pulls in some big names. When I saw that they’d be hosting Vanessa Williams live while I’d be home for Thanksgiving, my only thought was “shut up and take my money”. Vanessa Williams shows no signs of slowing down. With a career spanning over 30 years, she’s gearing up for a new VH1 show Daytime Divas, and appearing on VH1 Divas: Unsilent Night. 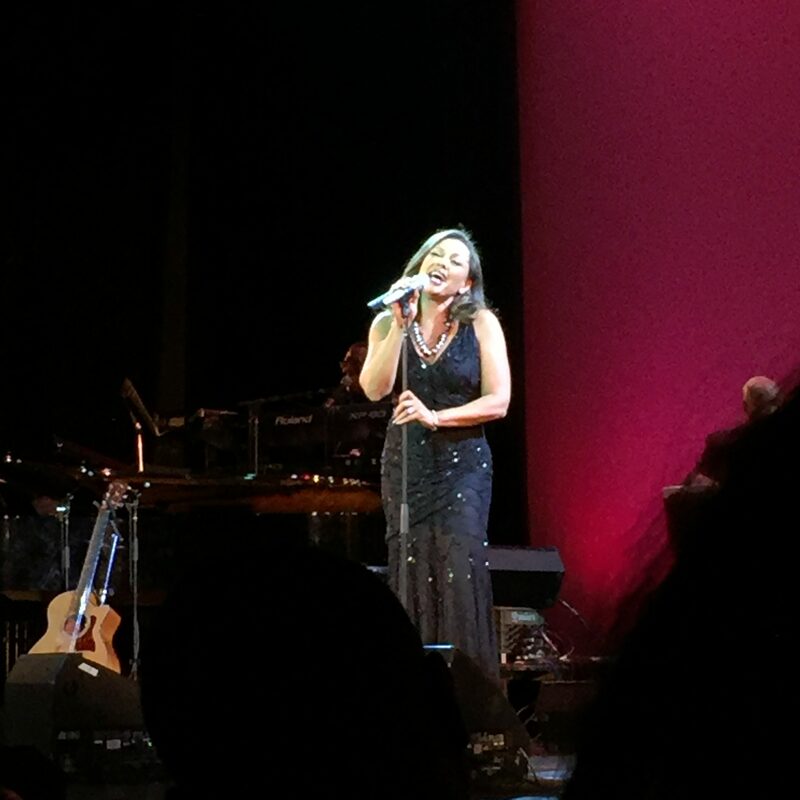 Tonight however, she made time to run through her extensive songbook at a small show in Rahway, New Jersey. Vanessa takes her time throughout the show, while still switching paces and covering her vast catalog. She opens the show with one of her latest songs “The Real Thing” from 2009’s album of the same name, also her latest release. Then we go back to 1988 with a medley of “The Right Stuff” and “Running Back To You”. Nostalgic and entranced is the best way to describe the crowd, as she transitions into her first big ballad “Dreamin'” before cracking a few jokes about how old her Brian McKnight duet “Love Is” actually is. One of my peak moments arrives next: “Colors of The Wind”. I proudly own the cassingle, and let’s be honest, I’m a 90’s baby and Pocahontas is a staple of my childhood. At this point it’s just incredible to hear how great she still sounds, especially when she reaches into her upper register on “Constantly” and introduces her stellar 7-piece band. Her voice sounds just as good as it ever did. And did I mention how flawless she looks? It’s as if the woman does not age. She takes a few moments to spotlight her Broadway years, noting that she loves performing on Broadway because she can sing, act, and dance all in one night. After a stellar reading of Lena Horne’s seminal “Stormy Weather” and a few others, she launches into one of the most noteworthy yet unexpected pieces of the night, “Peel Me A Grape”. Her introduction for the song set it up for flawless execution. Vanessa shared that one of her favorite roles to play is Wilhelmina Slater on Ugly Betty (a personal favorite of mine). Hence, she imagines “Peel Me A Grape” as a theme for the character. With lines like “hop when I holler, skip when I snap” and “When I say ‘do it’, jump to it!”, anyone familiar with the character can attest that the song is positively Wilhelmina. The song served as a the perfect transition back into her pop material. Finally, she took it back to the 80’s with “Work To Do”, the 90’s with “Oh How The Years Go By” and the grand finale “Save The Best For Last”. Because the show took place on Black Friday (aka fair game for Christmas music) she made my night, returning to perform an encore featuring 2 songs from the Star Bright album. First the title track, and finally my all time favorite, “What Child Is This”. The perfect end to a stellar set, and in conclusion, the ideal kickoff to the holiday season. If you have the chance to see Vanessa Williams live, do it. Furthermore, if finally seeing Vanessa Williams live wasn’t enough, I somehow found myself backstage after the show and got a chance to meet her. I’m still processing and reliving our moment doing diva faces while she snapped a selfie of us. Next Story → VH1 Divas Holiday: Unsilent Night Destroyed the VH1 Divas brand.